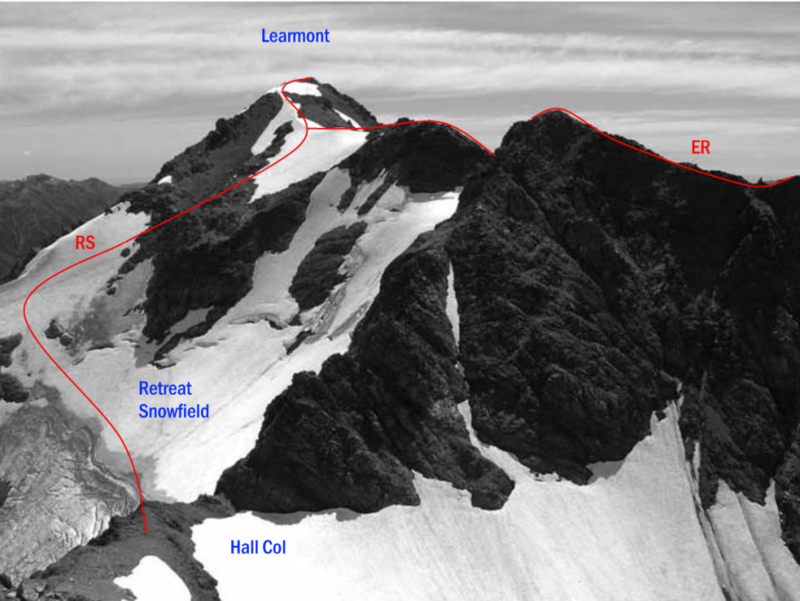 Reach the Retreat Snowfield from either Farquharson Saddle or Hall Col. At about the 1700- metre contour, swing north-west up snow slopes towards a rib. A diagonal gully now leads right to give easy access to the East Ridge at about 2000 metres. The East Ridge is a rocky scramble, but gaining it from Hall Col involves broken, gnarly gendarmes. The first ascent party descended along the Main Divide to the Hall Glacier and returned to the Gifford via Hall Col. The North Ridge is loose in places and has a very unpleasant, actively eroding gash about 200 metres from the summit. However, the north-eastern slopes of the mountain are simple rock scrambles in summer from the head of the Crawford Valley. Access up the stream bed beyond Crawford Bivvy is relatively easy all the way to the Main Divide.